It varies greatly among UK medical universities to study there. To be honest, this is in not only in the UK but around the world as well. For example, medicine is studied in graduate school after completing an undergraduate degree that is not directly related to medicine in the United States. On the other hand, students can enroll for undergraduate clinical degrees in the United Kingdom. Also, almost all clinical degrees span a good number of years, which is more than non-clinical courses wherever you study. As a result, when you commit yourself to an institution for such a long period of time, it’s best to ensure that you make a wise choice. Moreover, the students get the preparation for their careers through real clinical practice if they like to get a medical degree in the UK. The first formally established medical school in the UK, the University of Edinburgh Medical School. It was founded in 1726. Although the school was without a teaching hospital until 1794, this was followed by Glasgow in 1744. But, the ancient medical school in England is St George’s. It’s in the formal teaching since 1751. The foundation of the United Hospitals Medical School was formalized teaching at St Thomas’s and Guy’s hospitals in London in 1768. Being a part of Queen Mary, the London Hospital Medical College (LHMC) was founded in 1785. Moreover, the newly founded university colleges in London opened teaching hospitals in 1834, in the first half of the 19th century. Besides, the first medical school in Britain to teach women is the London School of Medicine for Women was founded in 1874. 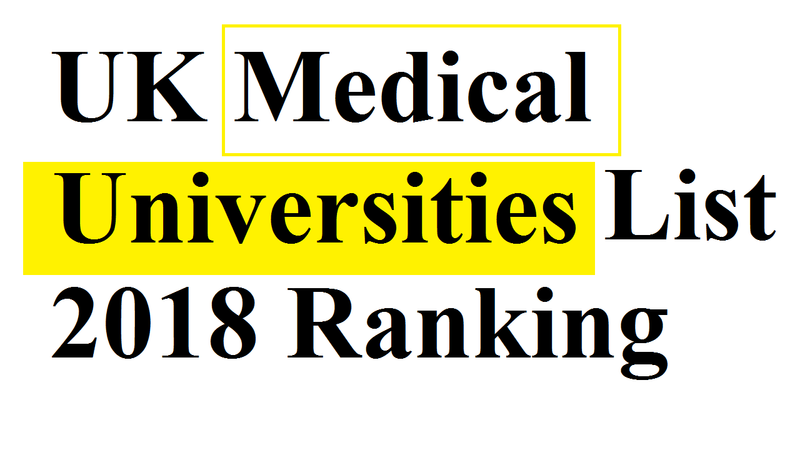 What are the Current Best UK Medical Universities? The traditional course at the University of Oxford is medicine. It splits into two parts, such as clinical stages and pre-clinical stages. Students are taught theoretically with a little patient contact in the first few years. Spending much more time at the John Radcliffe Hospital in later years they move to the clinical phase. Every year, 150 students get a chance to get the admission and another 30 on to a graduate course. These students condense medical studies in just four years from this university. From traditional theoretical classes to innovative and hands-on experience, the medical program at Imperial College London offers a range of teaching approaches. Students have direct contact with patients, unlike at other more traditional universities in the UK from the very first term. Imperial’s courses are heavily scientific, with an emphasis not only on clinical practice but on research techniques like both Oxford and Cambridge. Besides, there are high requirements for the entry. Students much achieve a high score in the BMAT exam along with top grades in chemistry, biology and a third subject. But, only a few overseas students are accepted on to the medical program each year apart from being one of the most international institutions in the UK. Stanford University provides masters and Ph.D. program to students who wish to further their medical training from their graduate school. There are more than 42 members of the Institute of Medicine are among the current faculty at the school along with 7 Nobel prize winners and 31 members of the National Academy of Sciences. Including cancer, immunology, genetics, and neuroscience among others, the researchers across Stanford Medicine are undertaking research across a number of different areas. There is a dedicated center for children, but the school provides healthcare for adults as well. It began life in 1785 as England’s first medical school. It’s the home to Barts and The London School of Medicine and Dentistry. There are more than 1,600 undergraduate and 750 postgraduate students. These made it one of the country’s leading medical and dental schools. Moreover, it’s world-class research and has invested £100 million in state-of-the-art facilities at the heart of the School. Research is focused on translational research, cancer, cardiac, dentistry, inflammation, etc. It has an annual research income of £40 million. This MBBS College in the UK proffers undergraduate students MBBS courses with its modern teaching techniques and method. Moreover, it’s various other options for postgraduate programs are available to study in the Edinburgh University’s College of Medicine. This is amongst the hugest UK medical universities. It stands 1-10 in the country and major meant for biomedical research. This university also offers various other options for graduate and postgraduate programs for the students. Because of this, the London Medical School of University College is on this list. This is one of the famous UK medical universities that are focusing on research in cancer and cardiovascular diseases and it the largest college area in Europe. Glasgow University proffers undergraduate students MBBS courses with its modern teaching techniques. Newcastle University offers a five-year medical degree program in partnership with Dundee University. This is the second in the world to have received permission to pursue stem-cell research in human embryos. Moreover, it’s the first university in Europe. This university is the fifth oldest MBBS University in the United Kingdom. Also, it’s proudly standing as the best college for medicinal studies in Scotland. This too provides several courses undergraduate and postgraduate programs. It’s not like other medical colleges in the UK.